• 1024 bits of read/write nonvolatile memory. • 256-bit scratchpad ensures integrity of data transfer . 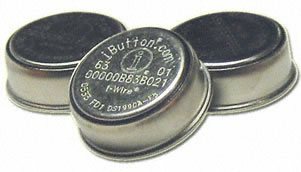 The DS1992 iButton is a rugged read/write data carrier that acts as a localized database, easily accessible with minimal hardware. The nonvolatile memory and optional timekeeping capability offer a simple solution to storing and retrieving vital information pertaining to the object to which the iButton is attached. Data is transferred serially through the 1-Wire protocol that requires only a single data lead and a ground return. The scratchpad is an additional page that acts as a buffer when writing to memory. Data is first written to the scratchpad where it can be read back. After the data has been verified, a copy scratchpad command transfers the data to memory. This process ensures data integrity when modifying the memory. A 48-bit serial number is factory lasered into each DS1992 to provide a guaranteed unique identity that allows for absolute traceability. The durable MicroCan package is highly resistant to environmental hazards such as dirt, moisture, and shock. Its compact coin-shaped profile is self-aligning with mating receptacles, allowing the DS1992 to be easily used by human operators. Accessories permit the DS1992 to be mounted on almost any surface including plastic key fobs, photo-ID badges, and PC boards. Q: Is there a tool or device to insert the iButton into the plastic holders? A: You can use an arbor press to snap the iButtons into the fobs. We also sell a snap in service. It typically adds a day to the delivery time of the iButtons. You can contact Sales@EmbeddedDataSystems.com for a quote. You would also find the DS9093F+ fob a bit easier to snap in by hand.